where they came from. Raised by different families, they remained connected by a special bond—always considering themselves siblings, despite their unknown blood relations. Now adults, Taina, Holly, Adrian, and Raymond have been summoned by the fifth, David, to an island off the coast of Connecticut and the family home of David's ex-girlfriend, Julia. But along with the joy of reuniting comes the exposure of raw places, jealousy, and childhood sorrows. Having been diagnosed with an aggressive form of brain cancer—and experiencing flashbacks to the time before the hurricane—David believes that healing his relationship with Julia and discovering his origins will strengthen his ability to endure and survive. David pushes the people he loves the most to their emotional breaking points in order to uncover the truth about the mystery that both unites and divides them. 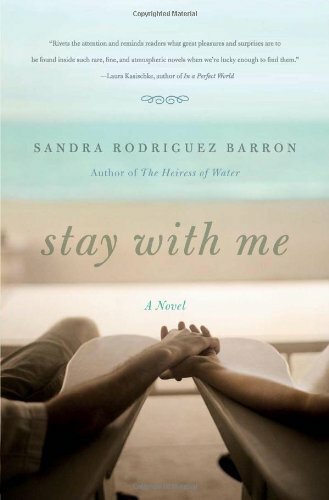 Intensely gripping and lyrically written, Stay with Me is a magnificent blend of romance, suspense, atmosphere, and intrigue that brilliantly explores the true meaning of family and the remarkable ways a personal history can paint a future.